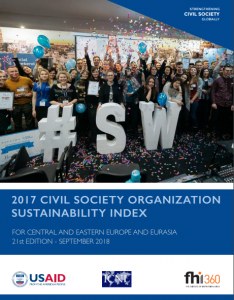 The United States Agency for International Development (USAID) published the 21st edition of their Civil Society Organization Sustainability Index (CSOSI) for Central and Eastern Europe and Eurasia, covering developments in 24 countries in the region during calendar year 2017. BCSDN has partnered with USAID and FHI 360 to produce the CSOSI for Macedonia, examining the overall sustainability of the CSO sector, by looking at seven specific dimensions of sustainability: legal environment, organizational capacity, financial viability, advocacy, service provision, sectoral infrastructure, and public image. The report will be presented in more details at a public presentation organized by BCSDN on the 4th October 2018 in Public Room, Skopje, starting at 10am. The full report for Macedonia is available in Macedonian and English language.